COMMENT DUE ON ACID LEACH URANIUM MINE – Protect Water for Future Generations. COMMENTS ON PROPOSED CHANGE TO ACID LEACH URANIUM MINE. – Had to be MAILED by Jan. 22nd. We will continue to monitor this issue and update as necessary. Please take a few minutes to read this and then to write a letter to stop a bad plan for uranium mining on the northwest edge of the Black Hills. Strata Energy operates the Ross in situ leach uranium mine in view of Mato Tipila, also known as Devil’s Tower, an important cultural/sacred site, and now a National Monument. This mine has been operating using the same type of leaching as other modern ISL uranium mines in the U.S., alkaline leaching. But now it wants to change to using sulfuric acid for the leaching. This would be the first commercial-scale acid leach uranium mine in the country. YOUR WRITTEN COMMENT MUST BE MAILED BY JAN 22, 2019 TO ARRIVE IN CHEYENNE, WYOMING. We oppose changing to acid leaching. 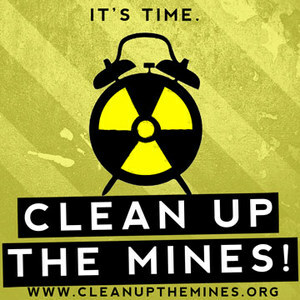 We want the mine shut down. Get written comments in the mail to the Wyoming Department of Environmental Quality by Tuesday, January 22. Mailing information is below. This mine should not be allowed to operate in sight of an important cultural and sacred site. Instead of extending its life by using acid leaching, the mine should be shut down. The history of in situ leach uranium mining shows that there will be leaks and spills of the sulfuric acid. Spills at some modern mines have been extensive, and you should not assume it won’t happen at the Ross mine. There hasn’t been much study of acid leach uranium mining by independent scientists (who aren’t working for uranium companies). The studies that do exist show that restoring the groundwater after mining is unlikely. The mine should not be switched to acid leaching. It should be shut down before any further damage is done. The money that has been set aside to deal with problems is not adequate. If acid leaching is allowed, then additional money needs to be set aside. It’s harder to restore water after acid leaching than after alkaline ISL uranium mining – and it takes longer. Strata Energy is part of Peninsula Minerals, a company from Australia. If there are problems, nothing prevents the company from walking away and leaving U.S. taxpayers with the bill. Many uranium mines in the Black Hills have been abandoned without being cleaned up. We don’t need another one. The State of Wyoming won’t take comments that are e-mailed or faxed, and comments must be received in Cheyenne on January 26 – a Saturday – so actually on January 25. Mail your comments by Tuesday, January 22, to Administrator, Land Quality Division, Department of Environmental Quality, 200 W. 17th Street, Suite 10, Cheyenne, WY. 82002.